"This is my ultimate pumpkin fantasy," farmer Cindy Tobeck said. 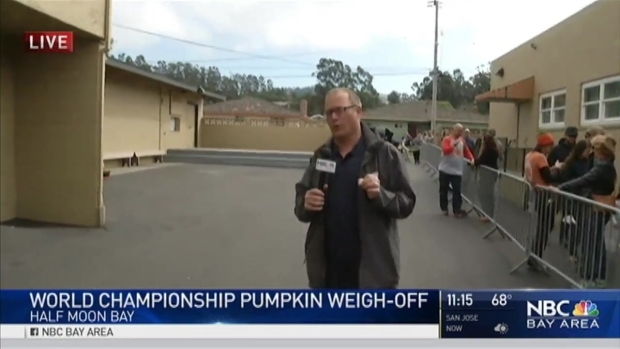 A third grade teacher who nicknamed her pumpkin "Orange Crush" won the 43rd annual Safeway World Championship Pumpkin Weigh-Off in Half Moon Bay. When her gourd clocked in at 1,910 pounds on Monday, Cindy Tobeck of Little Rock, Washington clasped her hands to her face, and waved to the adoring crowds while sitting on top of her massive gourd. "I am over the moon," Tobeck said. "This is my ultimate pumpkin fantasy." Farmers lined up early Monday morning, fingers crossed, hoping their gargantuan gourd would take home the prize in the annual pumpkin weigh-off in Half Moon Bay. Bob Redell reports. According to the weigh-off organizers, Tobeck is the third woman to have won the contest, since it first started in 1974. The last time a female farmer won was in 1997, and then 1991 before that. As farmers lined up, fingers crossed, before the sun came up at the annual folksy festival, Tobeck of Little Rock, Washingston, felt pretty confident. "I'm going to crush it," Tobeck said. "I just did everything right this year. There wasn't a weed in my patch." Tobeck also took no chances. She uses science to aid her in her growing techniques. She regularly sends off pumpkin samples to the lab to test it for nutrient levels, and she adjusts her fertilizer accordingly. But while Tobeck wins $6 per pound for a grand total of $11,460 — and of course bragging rights in the tight-knit pumpkin world — her pumpkin did not break a world record. The world record was set on Sunday with a 2,623-pound pumpkin that won the Giant Pumpkin European Championship in Ludwigsburg, Germany. Before that, the world record was set in 2014, with a 2,323-pounds pumpkin grown by Swiss grower Beni Meier during the same annual contest. She also didn't beat least year's Half Moon Bay winner. That honor, and prize money, went to Oregon farmer Steve Daletas, whose gourd clocked in at 1,969 pounds during the 2015 contest. The first weigh-off was held in 1974 when leaders from Half Moon Bay including then-Mayor Melvin Mello challenged Circleville, Ohio, to a weigh-off competition to determine the world's biggest pumpkin, according to contest organizers. John Minaidis of Half Moon Bay won the first weigh-off. His pumpkin weighed only 132 pounds.